Words of the Wise Acres: Run chicken run! Violet. She just can't help herself...she is really curious about the chickens. We have rigged up a temporary run for her using a long line attached to a clothesline type thing. She has quite a large space to roam and it will have to do until we figure out our fencing options. We have been debating various solutions to this potential conflict including adding a roof to the coop, changing the design all together and clipping Ella's wings...eek, not sure that I am up to that. Yesterday G. was playing with Violet and let her off her leash...unfortunately at the same time, Ella decided to take herself for a walk and flew up to the roof at the same moment as Violet noticed she was out. The chase was on and I was surprised to see just how fast chickens can run! Unfortunately the chicken headed for the door I left open of the house, in my haste to help G., where she met up with Farlee who moves a little slower but is still up for a game of chase the chicken around the kitchen. 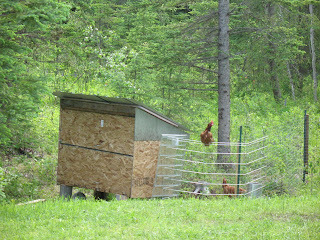 Finally we were able to grab Violet, put her back on the line and Ella headed straight back to her coop. G. put her in the run and funny thing...but she hasn't tried any further escape attempts since! 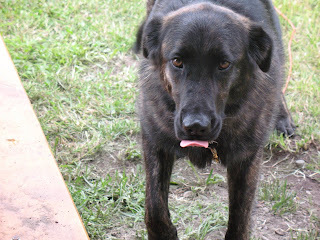 Love that Violet looks as though she is lickin' her chops in that picture. Good one. From my experience with chickens, I'd be less worried about Violet, and more worried about what might come out of the woods. We lost our entire flock of nearly twenty birds, including a very feisty Barred Rock rooster, to some unknown critter that managed to move a cement block that blocked the run entrance to the coop, on several nights, and wiped out the whole flock. I'd like hens again, but I need to build a bunker for them first! Better luck with your beautiful biddies! 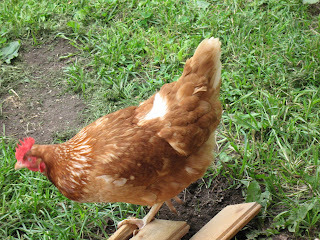 We solved the flying chook problems at our place by clipping their wings. It was scary to do it but effective. You cut just one wing just below where they are attached. I had the exact same escape problem last year when I finally properly fenced my coop (well, M-S and her husband came and fenced my coop and I helped). They would fly to the roof of the coop and then fly over the fence. I put a tarp up so they can't do that any more. It has the added advantage of keeping the coop shaded and dry and a dry spot in the chicken yard where I can keep the feed dish, etc.